Two of the worst times to detangle your hair is when you’re in a rush or extremely tired. Of course, there will be times when these circumstances are unavoidable, but it’s important not to allow this to cause you to cut corners and ultimately cause more damage than good. You don’t want to rip through your strands rapidly so that you can hurry up and get it over with. Try your best to prepare for wash day so that you will have time to effectively detangle. And if you’re still on a time crunch, the next few tips will still help you maneuver through your tangles with ease. You can detangle before or after washing your hair, but make sure your hair is saturated with water and some kind of conditioner. 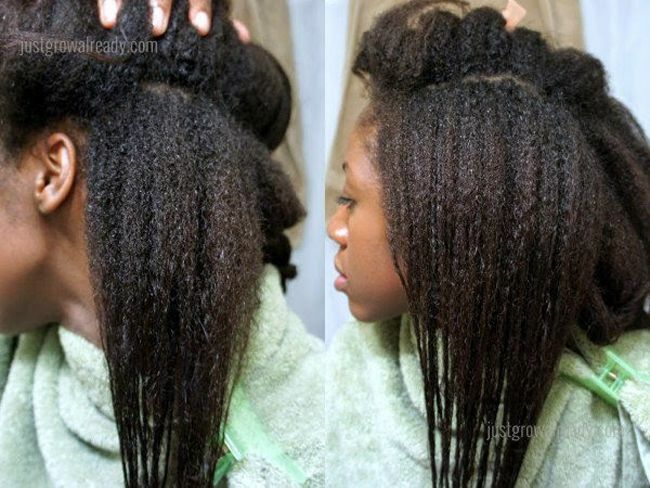 Do not detangle dry hair because it is far more likely that you will cause breakage if you do. It sounds time-consuming and exhausting, but it’s actually a time saver that your hair will certainly thank you for. Finger detangling simply means going through your hair with your fingers and separating any tangles that you feel, starting with the ends and working up to the roots. For added slip, you can use latex gloves: they work with your conditioner to smooth the hair and make for an even easier detangling session. Some transitioners only finger detangle and don’t use combs at all, which is perfectly fine, but to ensure that all of the tangles are out, you can follow up with a wide tooth comb. When you choose a wide tooth comb, make sure to find a seamless comb like this one by Hercules Sagemann. These combs have been widely recognized in the natural hair community as a terrific combs for detangling. A seamless comb won’t snap or snag on your hair and will help you glide through the tangles much more efficiently. Depending on the length of your hair, you may have a vast amount of territory to cover. If you have medium to long hair, divide it up into 4-8 sections. Doing this will help you seek out every tangle, whereas if you were to try and detangle your entire head at one time, you might miss some. Plus, when you detangle in sections you are able to clip away the parts that have already been detangled; you can twist or braid the section of hair to keep it stretched. Don’t neglect the importance of conditioner as an agent to get your hair properly detangled. You want to use a creamy conditioner that will soften your strands, making them more pliable and therefore easier to separate from one another. Adding oil also helps with making your hair more manageable for this process. Also, many naturals like to detangle in the shower because the stream of water helps the conditioner slide down the hair shaft and tackle the tangles. This post was written by BlackNaps.org for CurlyNikki.